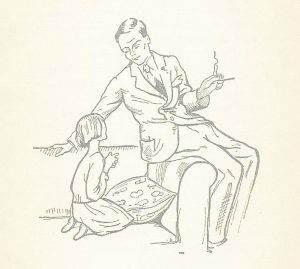 The late nineteenth and early twentieth centuries have been called the Golden Age for children’s books, especially, perhaps, books aimed at girls. 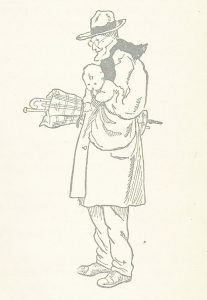 Writers like Frances Hodgson Burnett (1849-1924) wrote books with female heroines who were firmly centre stage – like orphans Sara Crewe in A Little Princess (1902) and Mary Lennox in The Secret Garden (1911). Both had to struggle with abandonment and loneliness and, in Sara’s case, poverty. They were allowed to have their own adventures, as opposed to being also rans in boys’ adventure stories. 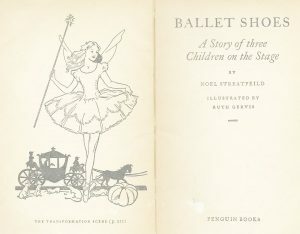 Ballet Shoes, which opens in 1920, is the story of three foundlings, Pauline, Petrova and Posy, adopted as babies by the eccentric fossil-hunter, Professor Matthew Brown, known as Great-Uncle Matthew (Gum for short). He rescues Pauline from a sinking ship in December 1920, brings her back to his large London terrace house in Cromwell Road, Kensington which his long-suffering great-niece, Sylvia, runs during his absences. A year or so later, he turns up with another orphan, Petrova, soon to be followed by Posy. And then he disappears, leaving Sylvia with enough money to support them all for five years. But this time he doesn’t return. In addition, Ballet Shoes is a school story – the girls attend The Children’s Academy of Dancing and Stage Training, which is also a Theatrical agency arranging professional theatre employment for its pupils. When the Cromwell Road money runs out, Pauline and Petrova’s earnings are desperately needed to help the family finances. Interestingly, no-one at 999 Cromwell Road is, in fact, related to anyone else. As the late Angela Carter observed in Nights at the Circus, people can create their own families, they don’t have to be blood-relations. This is certainly true in Ballet Shoes; Pauline, Petrova and Posy choose their own surname, Fossil, and make a vow every year: ‘We three Fossils vow to try and put our names in history books because it’s our very own and nobody can say it’s because of our grandfathers.’ As I child I thoroughly approved; I was fed up with being told that my writing must have come from one of my great-aunts and that I would soon grow out of it. 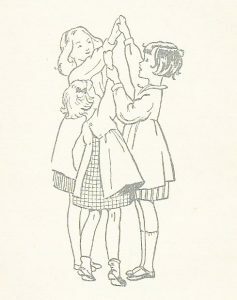 The book was published in 1936 and thinking people at the time would have been increasingly worried about Hitler coming to power in 1933 and the spread of Fascism, but Noel Streatfeild ignores this; she is writing a family story about ballet and the struggles of her three orphan heroines and, quite reasonably, she wants the focus to stay with them. No-one in Ballet Shoes is remotely politically minded. However, it is interesting how accurately she depicts class assumptions and how people lived at the time. In that respect, she catches the zeitgeist perfectly. The huge terraced house is run by five servants. 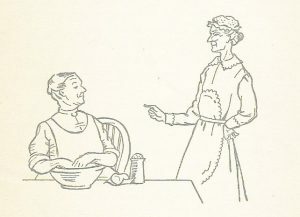 There is Cook and the house maid, Clara; Nana, once Sylvia’s nurse and now looking after Pauline, Petrova and Posy; and two more unnamed maids. Even accounting for the fact that female wages were a lot cheaper than male wages, the cost of a cook, a nurse and three maids was not nothing. As well as their wages, they also got their board and lodging. However much Sylvia scrimps and saves, the money Gum has left for their support eventually runs out. In the 1920s, with the country edging towards the Depression, there is no way than a middle-class female, like Sylvia, with no special training in anything, can find a job that will support them all. 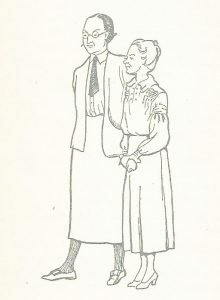 She is forced to turn their home into a boarding house and she lets out rooms to Mr and Mrs Simpson, a couple who have just returned from Malaya; Miss Theo Dane, a dancing teacher, who wants a room on the ground floor so that she will not disturb people when she is practicing; and two retired ‘Lady Doctors’, Dr Jakes and Dr Smith, doctors of literature and mathematics. Sylvia runs the boarding house in a way that Dickens would have recognized. Although the lodgers had the means to make a cup of tea and toast in their rooms (a kettle you could swing over an open fire, and a toasting fork, as Lawrence of Arabia had in his cottage at Clouds Hill at roughly the same date), they usually dined with the other lodgers in the dining room. This is what Sylvia preferred as she charged extra for meals; she made money out of the meals; the actual rent, which was very cheap by modern standards, covered only the basics. 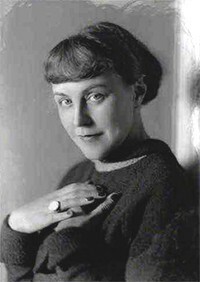 Noel Streatfeild doesn’t go into the bathroom facilities but the lodgers would have had a common bathroom, comprising bath, wash basin and lavatory, together with a separate lavatory and wash basin. Times when they could have a bath would have to be negotiated between them. In 1932, when she reaches twelve and is allowed to earn money, Pauline has to get an acting licence from the London County Council at County Hall in order to act professionally in a theatre production of Alice in Wonderland. Coincidentally, my own children also had drama classes as children and they, too, needed licences from County Hall when they got professional jobs, as they occasionally did. 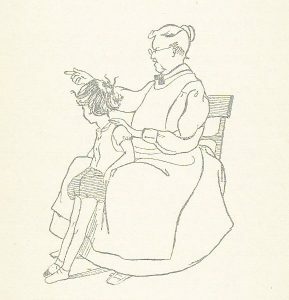 The first time I took my son there, I suddenly remembered Nana going with Pauline – and the procedure was exactly as Noel Streatfeild described. The family might be struggling financially, but, when they were small, the Fossil girls were taken regularly to the nearby Victoria & Albert Museum. Culture is important – Dr Jakes is a Shakespeare fan and determined that Pauline should learn to speak his verse with confidence. And this, of course, helps her future career. 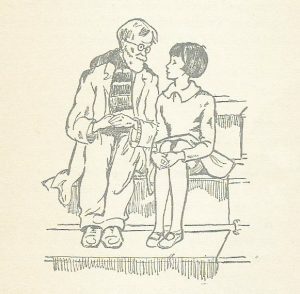 The two doctors also take on the girls’ education (for free) when the cost of the private Cromwell House School becomes too much for Sylvia to pay. We note that it never crosses her mind to send them to a local school. 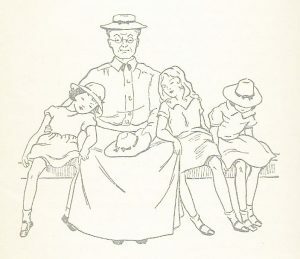 Mr Simpson’s picnic: l-r: Mrs Simpson, Nana, Pauline, Mt Simpson, Petrova and Posy. Interestingly, Sylvia, who was also there, is missing. The other thing which is very much of its period is that poor Sylvia has been left on the shelf. She’s quite a young woman, probably in her mid-twenties when the book opens but, towards the end of the book, Nana notes sadly that her hair is going grey and that her face is lined with worry. We realize that Sylvia is one of the generation of young women whose possible future husbands were killed in World War I.
Nana, who has been chaperoning the girls at an evening theatre performance, brings them home on the Underground. When I was a child, this didn’t bother me – it was just Gum being eccentric, but, when I became a teenager, I found myself thinking that if the ‘pack of women’ stopped all the cooking, cleaning, washing and mending they normally did to keep the house going, Gum would be totally lost. Underneath the gripping story which has enthralled generations of girls, there is also a covert, and critical, look at who pays the price. Gum’s way of life is predicated on the ‘pack of useless females’ to keep things running smoothly. 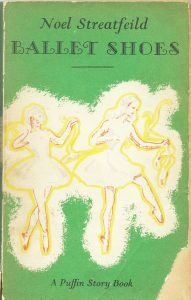 The single-minded, some might say self-absorbed, Posy, is determined to learn ballet-dancing from the Czech world-class ballet teacher, Monsieur Manoff, and for that to happen, fourteen-year-old Pauline must give up her dream of becoming a classical actor in order to support Posy financially by accepting the Hollywood part she’s been offered. Sylvia will have to go to Hollywood to be with her; and Nana will have to go to Czechoslovakia to chaperone Posy. When I re-read Ballet Shoes before writing this post, I found myself thinking that the book ends in 1934 and a certain Adolf Hitler has plans which will upset Posy’s classes with Monsieur Manoff in Czechoslovakia, but they will also, perhaps, bring unexpected opportunities in America for Sylvia, who has been too unselfish for too long. Oh oh oh, I have that same copy with the same illustrations. I adored the story as a child and – being the eldest in a single-parent house – identified ENTIRELY with Pauline. I didn’t take in all the other ramifications at the time, but it did give me a very clear idea of what life was like then. I think it is always the sketched-in details around the edges of contemporaneous novels that speak far louder than factual accounts. Oh Jan! How nice to find a fellow-enthusiast! I agree that ‘Ballet Shoes’ gives a very clear idea of life in London in the 20s and 30s. I found myself wondering whether the Cromwell Road house had a vacuum cleaner and a fridge and things like that. 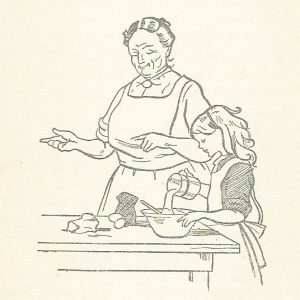 Quite possibly not, and Sylvia would have needed the extra two maids – who are only mentioned in passing – to keep the house clean and to do the heavy work like scrubbing the floors. I completely agree with you. In fact I gave a copy of Ballet Shoes to the daughter of a goddaughter only last Christmas because I loved it so much. My copy went the way of all my childhood books, when my mother was feeling appallingly generous to a local charity. I grieved for years over that. Possibly still grieving, now I think about it. But I think it must have been a later edition. I never accepted Gum, I’m afraid. It was the one element that made me want to argue with them all. Though I had hopes that Petrova might come to her senses in time. Thank you for your comment, Sophie. I agree that Gum is a problem – perhaps much more so in the 21st century. I agree about Petrova. Why would Gum be less monumentally selfish with regard to her than he has been with Sylvia? I can all too easily see him expecting Petrova to give up her career, just when it’s got started, to look after him if he has a fall or something. Ah, you see Gum didn’t bother me at all. I was USED to the failings of the absentee male. I have no doubt that Petrova runs rings aound him as she grows up. When I was about 6 I was staying with my Gran in her little cottage in St Ives, and caught ‘flu. A friend of Gran’s brought in a bundle of books, including Ballet Shoes – which I devoured, and enjoyed, and have several times since. Thank you for your comment, John. I’m sure that Noel Streatfeild would have been delighted to know that a boy enjoyed it, too. I can quite understand why you identified with Petrova – though I have my doubts about Gum! Such an enjoyable post, Elizabeth. I loved this novel, but sadly my copy is long gone. I think I’ll order for a friend’s daughter and sneakily read it before handing it over. Interesting comments…I totally fell into the book and accepted GUM’s absences without question! 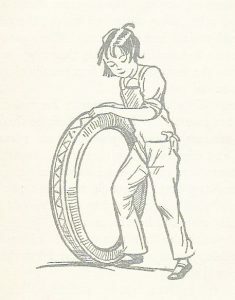 While I’m here, please could you help me with the title of another book I remember fondly from childhood? Also with a London setting, there were two girls – one, maybe the narrator and whose name I can’t recall but the cousin was Ann Marie and she became an actress. 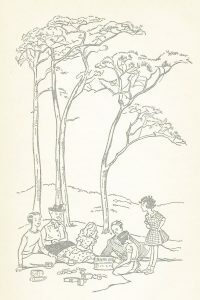 The narrator was star-struck and managed to secure a part in a play where her cousin played the lead. There’s one line I can remember: ‘T’is always dreaming by the fire ye are, Miss….and that was part of the narrator’s script in this play. Ann Marie goes off to Hollywood in the end. Sorry to land this on you but I just can’t remember the book’s title. Thank you for dropping by, Jill. If you are thinking of buying a copy, I believe that Penguin still uses the Ruth Gervis illustrations, though other publishers don’t. I, too, had no problem with Gum’s absences when I read the book as a child. After all, for children, grown-ups are always doing inexplicable things! I’m really sorry but I can’t identify your mystery book, though Kitty Barnes is an author’s name which springs to mind. Still, perhaps someone who reads this post will know it and leave a comment. You could try Googling Children’s book, London setting, rough date, Ann Marie, first person narrator, and any other details you can remember and see what comes up.